At the age of 18 months my mother was told by the doctors that she might as well make up her mind that she had a helpless vegetable on her hands the rest of her life. There were two factors however that the doctors Hadn’t counted on. First was the power of the almighty God in my life, and second the determination and faith of a praying mother. With prayers to petition the Lord for my life, and the faith to believe He would lead her to the right solution; I was taken at the age of 4 to Shriners Children’s hospital 165 miles from home and signed over to them. of the distance and our financial state, my mother could only visit once a month. This began a very lonely period in my life, facing a number of surgeries alone. (My parents were not allowed to be present). much, but you see the one He is holding in His arms? I have a feeling that little lamb needs just a bit more love. You see the tender look on His face as He gazes lovingly at it? 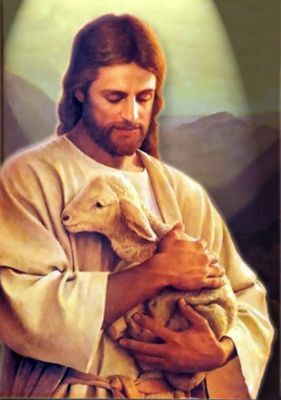 Well that little lamb is you, honey, and even though I can’t be with you when you face your surgery, don’t forget Jesus is holding you in his arms just like in the picture, and He will not allow any harm to come to you.” This very thought along with the fact of knowing was what sustained me as I lay in the dark awaiting surgery the next day. At the age of 14 I was released from the hospital’s care. The doctors told me they had done all they could do. but my, how much the Lord and they had accomplished. From walking on my toes with my knees bent I could now walk flat on my feet with my legs straight. I was able to get around on my own with the aid of crutches. Praise the Lord! The pressure of these years however, did eventually take their toll in the form of a perforated hemorrhaging ulcer. At the age of 17 I was admitted to the hospital again. After four weeks of blood transfusions, the doctors decided I was built up enough to face surgery. Part of my pre-op treatment was to have a tube inserted through my nostrils into my stomach. Having a somewhat spastic throat, each time the tube would reach my throat, I would vomit. Somehow after about three hours of working, the doctors were able to insert a small tube to which the stomach pump would be attached after surgery. To date I have had approximately 44 surgeries and none were as traumatic as this one. Some time after the surgery the tube, which the doctors had inserted into my stomach, begun to clog up. The doctors felt they had no other recourse than to remove the small tube and insert a larger one. My mother, knowing how I had suffered the first time, and knowing how very ill I was now, just could not see this happen. While the doctors went out to get the tray, she did the only thing she could. She prayed “Lord this is just a small thing but it would mean much to me, please allow the tube to unclog.” Wonder of wonders, by the time the doctors returned the tube was free and continued to function properly as long as it was needed. Thank you Lord! In my teen years I did not always follow the leading of the Lord. I set out to prove that I could be and do anything my friends could and I did it. (Well almost). I always told my mother I probably never get to marry, because in those days there was a stigma attached to being “handicapped” but she assured me that some day someone would come along that would love me for my personality and the love I had to give and that “he” would not even see my handicap. Being of the nature I am, I sometimes hurried ahead of the Lord’s plan and took things into my own hands, which led to some poor choices. However it seemed through all this that the Lord had a way of turning the “poor choices” around and having something good come from them. I am now married 50 years to a very kind man, I have a wonderful daughter, granddaughter and now a great-grand son! The Lord enabled me to work 19 years and then retire. As I reflect on these things I can see the pattern of the Lord’s hand working in my life. He gave my mother 10 years of nursing to prepare her for this thing that was to happen later on in her life. The paths He led me on, some of them being very hard, have served to build my faith, stamina and character. God has led me to be an effective witness to His loving kindness and mercy. I’m writing this to let you know that what you’ve was really so sincere and touching that i would simply not forget this…thanks for sharing this with me, and I’m so very glad for you bravely sharing your experience with me and all those who have read this so far. I”m grateful for the fact that i stumbled upon this article. You have no idea what this me about to me. you have very well made my day. Please do continue what you’re doing though. God bless, keep, and continue to love you always. I really do wish that such a lovely soul like you would be able o rest in his arms peacefully for blissful eternity, just like in the picture above. Wow, what a beautiful testimony God has given you. I too know much about how our faith can sustain us during difficult times. I grew up in a home with an abusive father and I learned at a very early age that my heavenly father was always faithful and true. My husband and I will be married 37 years in August. We are retired from music ministry and have one son, Brian, who is Gods gift to us. I think that your attitude and your faith has also sustained you. I think God has never stopped creating and that is why He chose to give us a capacity to create and bless others. It’s why I crochet, cross stitch, scrapbook and many other things. It gives me an opportunity to not only bless others with it but also to share the gospel with them. I love your website and I think through everything He has also given you a wonderful opportunity to share His love. Thanks for the kind words.I’m glad to know that my website touches hearts for my Lord.This is my way of celebrating the fact that He loves me. and through this website if I can lead one soul to know and to love Him, my effort will not be in vain. Keep in touch, we Christians need each other more then ever. This is amazing and incredible! The power of prayer is awesome! Thanks Bonnie for visiting my website. It has been a real pleasure getting to know you.! !